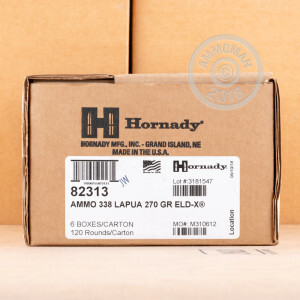 Even by their own standards, Hornady puts a lot of care into the creation of a Precision Hunter load. 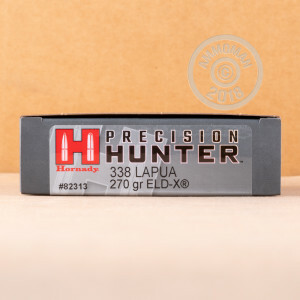 This 338 Lapua Magnum cartridge has the best brass casing that its manufacturer can draw and taper, and its clean burning propellant is loaded with scientific precision so that it can deliver a consistent chamber pressure and muzzle velocity regardless of temperature. It’s bullet has been perfectly seated, and what a bullet it is -- the ELD-X! The Extremely Low Drag - eXpanding projectile is the perfect solution for hunting at any possible range. It is intensely accurate courtesy of its ballistically efficient secant ogive profile and boat tail base, and its AMP jacket ensures that its trajectory doesn’t falter from the path its shooter sent it along. The ELD-X also features the Heat Shield tip, which won’t lose its symmetry no matter how hot it becomes! 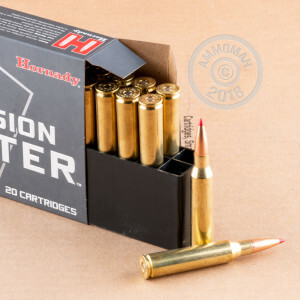 This bullet’s InterLock ring ensures that its jacket and core stay together even during high velocity penetration, and over longer distances it expands catastrophically while still retaining no less than 85 percent of its weight.